Our Honda Element Sweep kits are an attractive addition that will separate your Element from the norm. They are offered in a variety of colored vinyl’s that includes, “wood”, and spectacular color shifting flip-flop materials. Every kit also includes our exclusive quarter round trim moldings (for a factory like finish!) in Pearl Beige for the color shifting and wood grain with the wood kit. The new Honda Element Sweep Kits are designed for the home installer, or can be installed by your local body shop. All components are pre-formed, labeled, and detailed photo-illustrated instructions are provided. Also, tech help from our professional installe rs is only a phone call away. All the materials provided are OEM approved and manufactured in North America at ISO 9001 facilities. The use of high quality application specific materials permits us to offer a 3year warranty against defects in workmanship and materials. Honda Element Sweep Kit Carbon Fiber Please Call! $599.00 Please Call! Honda Element Sweep Kit Blue/Red Please Call! $599.00 Please Call! Honda Element Sweep Kit Cyan/Purple Please Call! $599.00 Please Call! 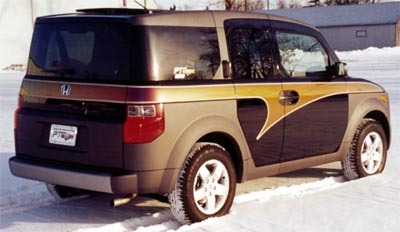 Honda Element Sweep Kit Gold/Silver Please Call! $599.00 Please Call! Honda Element Sweep Kit Purple/Green Please Call! $599.00 Please Call! Honda Element Sweep Kit Pearl/Silver Please Call! $599.00 Please Call! Honda Element Sweep Kit Silver/Green Please Call! $599.00 Please Call!